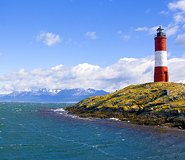 Discover Ushuaia during your fully customizable Argentina vacation. All of our Argentina tours have daily departures and are covered by our price guarantee. Nestled in the wild and rugged environment of southern Patagonia, Argentina, Ushuaia is about as far south as a city can be, and is commonly adorned the title of “The Southernmost City in the World” or even “The End of the World” as a sign proudly announces upon entrance to the city. Jagged and snow-covered mountains aside the shores of the deep blue Beagle Channel give this city an awe-inspiring backdrop. The town’s charming housing is constructed with colorful timber and tin roofing and has managed to retain its laid-back pioneer-town atmosphere. The Ushuaia region has been inhabited by indigenous communities for thousands of years, but the city was only formally created in the late 19th century when European explorers came to the area. 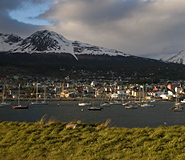 Ushuaia fluctuated in size over the course of history, so to ensure the city’s continuity the Argentinean government decided to build a prison to provide stable jobs for the small community. The prison, closed in 1947, once held the country’s more infamous criminals and famous political prisoners. Despite its isolation, Ushuaia offers ample modern amenities and services making it the perfect base for exploring the epic Tierra del Fuego National Park and other adventure activities nearby, including hiking, trekking, skiing, and boat trips. Ushuaia is also the perfect place to launch cruises to the desolated and strikingly beautiful Antarctica, the true “End of the World”. Explore this incredible region with a once in a lifetime Patagonia tour. Ushuaia Tours. Anyone interested in Patagonian history will be kept very busy at the city’s numerous historical museums. The End of the World Museum specializes in the history and anthropology of Ushuaia and the surrounding region, while the former Penitentiary now features fascinating displays providing insight into the history of this group of people who made the city what it is today. The ex-prison building also houses the Police Museum, the Antarctic Museum, and the Maritime Museum. 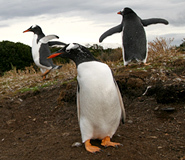 Visit Tierra del Fuego National Park. Ushuaia is the ideal starting point for travelers en-route to a Patagonian adventure in the Tierra del Fuego National Park. This spectacular park is a perfect example of the Andean and Patagonian forests of southern Argentina and makes for wonderful excursions. With such a fantastic landscape to explore, various outdoor activity options are also available, including trekking, horse-riding, sport-fishing, mountain-biking, mountaineering, skiing, and sailing along the Beagle Channel to Cape Horn and the Antarctic Continent. Take a ride on the Tren del Fin del Mundo For a glance at the history of Ushuaia, a ride on the End of the World Train is a must. Once used to transfer prisoners to the labor camp near the city, the train route begins on the outskirts of the city and winds through beautiful Patagonian landscapes of rich and diverse forests, winding rivers flowing through smooth valleys, and glistening white mountains reflecting in the blue waters. There is also a stop at the beautiful La Macarena waterfall which shoots through lush green vegetation and from here an excursion can be made to a small native village which is characteristic of the settlements of the indigenous peoples who inhabited the land before the arrival of Europeans. Skiing. Only 16 miles (26 kilometers) from Ushuaia stands the beautiful Cerro Castor and its modern, fully-equipped ski resort, perfect for those looking for adventure activities combined with top-notch facilities. Mount Castor is surprisingly only 640 feet (195 meters) above sea level and its top rises to 3,467 feet (1,057 meters). Here, you can try your hand at Nordic and Alpine ski, travel through forests on snow rackets, and enjoy the breathtaking views as you take the lift up the slopes. This great resort, a bargain because it is among the least expensive in Argentina, is complete with over 20 slopes of various difficulty levels, brand new infrastructure, a skiing and snowboarding school, and modern lifts. The warmest time of year is in the summer season from October to April, although the weather is always unpredictable in this corner of the world. March-April is an interesting time to visit in order to experience the autumn colors. It gets quite cold in winter (June-August), but you’re guaranteed to have the place to yourself, devoid of crowds of tourists. It’s also the best time to enjoy the slopes of Cerro Castor, Ushuaia’s excellent ski resort, open from July to October. Argentina was so beautiful and diverse, and Argentina For Less was definitely a good choice for us. You were able to meet our needs and help us find an efficient way to move around the country, and provide us with suggestions for tours and accommodations. Lenny, the tour guide for our Ushuaia tour was fantastic! She was excellent in providing history, political, geographical, flora, fauna and all other types of information. Truly a wonderful tour, as was the Beagle Channel crossing. We wish we had stayed a day longer in Ushuaia to do a penguin tour. From our initial communication with Argentina For Less, we have been impressed with the agency's professionalism, flexibility, efficiency, attention to detail, care, and kindness. Argentina is a beautiful land with wonderful people. We spent three fantastic weeks exploring just three areas and came away wanting more - and soon.